Radical Presence: Black Performance in Contemporary Art is the first exhibition to survey over fifty years of performance art by visual artists of African descent from the United States and the Caribbean. Black performance has generally been associated with music, theater, dance, and popular culture. While the artists in Radical Presence draw on these disciplines, here their work is considered in relation to the visual arts. The show begins with examples dating from Fluxus—a loose international network of artists from the 1960s and ’70s—and Conceptual art of the same period, and continues up to the present day. Featuring live performances as well as objects, Radical Presence includes more than one hundred works by thirty-seven artists. Some employ photography and video to document their performances. Several perform for the camera—in front of an audience or alone—intentionally constructing records of actions and events. The exhibition also presents objects used in performances: costumes, scores, sculptures, and installations, which, depending on when viewers see them, serve as prompts for or traces of performances. Both the live performances and the art objects call attention to the possibilities and limitations of the active body, and the installations reflect some of the myriad ways in which museums have exhibited this ephemeral medium. Although the artists span three different generations, they share a number of approaches. Many make durational works that unfold over several hours or even days. Some employ everyday, transitory materials—for example newspapers, food, snow, and bodily fluids. Others intervene into public spaces such as the street, parades, and the Internet to spark interactions between viewer and performer that may range from confrontational to humorous, politically motivated to mystical. Seen together, the works enable us to trace lines of influence. Some of the artists have worked in close collaboration with one another; others make direct reference to the work of earlier generations. Using their bodies as medium and material—often pushing the limits of their physical stamina—the artists in Radical Presence may experience pain, draw the attention of onlookers, or access otherworldly states. They channel and challenge a history of performance that includes forms as varied as minstrelsy and contemporary pop, experimental music and improvisational dance. Engaging viewers, they implicate their audiences as collaborators, breaking down distinctions between spectator and participant, and, like others before them, art and life. Organized by Valerie Cassel Oliver, Senior Curator, Contemporary Arts Museum Houston, Radical Presence is presented in New York in two parts: Part I at New York University’s Grey Art Gallery (September 10–December 7, 2013) and Part II at The Studio Museum in Harlem (November 14, 2013–March 9, 2014). For its New York presentation, the exhibition at The Studio Museum in Harlem is overseen by Thomas J. Lax, Assistant Curator. Radical Presence: Black Performance in Contemporary Art is supported by generous grants from The Andy Warhol Foundation for the Visual Arts, the National Endowment for the Arts, and the patrons, benefactors, and donors to CAMH’s Major Exhibition Fund. The catalogue accompanying the exhibition is made possible by a grant from The Brown Foundation, Inc. Funding for the presentation at the Grey Art Gallery is provided by the National Endowment for the Arts; Tisch School of the Arts, NYU; the New York University Arts Council; Susan and Steven Jacobson; Jane Wesman and Don Savelson; the Department of Art and Art Professions, Steinhardt School of Culture, Education, and Human Development, NYU; the Grey’s Director’s Circle, Inter/National Council, and Friends; and the Abby Weed Grey Trust. Generous in-kind support has also been received from The Wall Street Journal and James Cohan Gallery, New York. 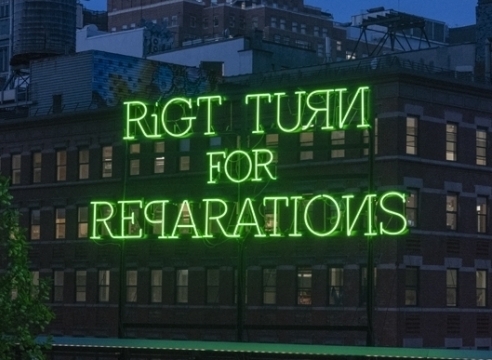 Funding for Radical Presence at The Studio Museum in Harlem is generously provided by Lambent Foundation. radicalpresenceny.org was designed by William B. Marshall in collaboration with Jamillah James, Communications Coordinator at The Studio Museum in Harlem, with assistance from Monique Long, Curatorial Fellow.